Suave Tequila is produced at Hacienda de Oro Distillery in the valle in Amatitan, Jalisco, Mexico- NOM 1522. Suave was founded by Cesar Andre and Joseph Varnado, who became partners after they met in the agave syrup business, and decided to start this tequila project. Varnado left the business after 3 years, and Cesar Andre become the sole owner of the brand. Jaime Villalobos Sauza, a fifth generation tequila maker, is the Master Distiller, whose family has deep roots in the tequila world. Sauza is a name in the tequila world that needs no explaining. As he told me "I have tequila running in my veins". The distillery is owned by David Partida, but Villalobos Sauza told me "we work in Hacienda de Oro as if it is ours, with 100% control on the production process." Villalobos is the Master distiller for Suave Tequilas as well as the unique Tequilcello lemon flavored liqueur. At this time Suave Tequila makes a blanco, a rested lunar blanco and a reposado. According to Villalobos the anejo is ready in the tanks at the distillery, but it is not bottled yet, and will be in the market in the next 6 months. The brand is called 'Suave', and the word itself means 'smooth', but the 'suave' terminology has often been used to describe a mellow or smoother profiled tequila, but not necessarily rested in wood. The Suave line is single estate and small batch, all numbered and signed by Villalobos Sauza, and they all are certified Organic and Kosher. The Tequilcello is also certified Kosher. Even the distillery is certified organic, and they are certified by one of the most thorough and prestigious certification companies, BCS Oko Garantie GmbH from Germany. Jaime Villalobos told me "the CRT is not regulating the organic certification yet, so it is up to the brands to decide which certification company to work with, and we decided to do it with the German agency, because they seemed to be very formal. Suave Tequila is produced with small family agave farming, is naturally fermented and uses absolutely no additives ever, according to Villalobos. Jaime told me, for example "we only produce one or two autoclaves for every batch, and every expression, and every single batch will be different to the last one, because I like the weather, the temperature, and the humidity, to express itself during the time of the fermentation." To me that is what you want, and this is the opposite of mass produced, being more artesanal, and more like a craft tequila. See Jaime Villalobos Sauza (BELOW), who is also a wine sommelier, respected internationally as the past President of ONSOM, the Organization of Sommeliers in Mexico. The bottles are a nice twisted glass design with nice embossed labels, great tops (all different depending on the expression) and an agave printed on the inside label. The Blanco and Lunar Rested blanco are the exact same batch. Villalobos told me "I divided the batch and sent one part to bottling as blanco, and sent the other part to barrels for 28 days for lunar, and I have a larger cut off of heads and tails in both cases, including the Reposado." Villalobos uses 8.25kg of agave per litre of tequila blanco at 40% abv, when the average of a traditional process is 6.9kg of agave per litre of tequila blanco at 40% Abv. This adds to the smoothness, and of course the 'resting', in the 'lunar rested blanco' also adds to smoothness. They also use all natural yeast, and Villalobos explained that each batch can be different.... and he loves that. As Jaime points out, "I haven't added not one single drop of any additive, for color, aroma, texture or flavor, and it is 100% product of the production process." He explained that he enjoys the differences between batches, because they represent the expression of the moment when the tequila was made. I like that myself, as it shows this is not a commercialized cookie cutter recipe, and I love that no caramel coloring is added in the rectification stage, when some brands use coloring to balance the color after blending. Suave says they do not do this, so batches may even be slightly off color from previous batches. I can't tell you how great and clean that is, and how this should be how all tequila is made.... additive free. What you always want to know, is that what you're drinking was made cleanly, with no additives including colorings, and depending on fermentation, could even taste slightly different from a previous batch. Suave rests and ages in the same barrels the whole way through, before blending. Jaime Villalobos made a good point, which confuses some people who simply do not know about this procedure. He explained that "the concept of 'single barrel' is misunderstood sometimes, that single barrel means that the tequila wasn't changed from barrel to barrel during the aging, and he doesn't do that." He went on to say "we keep the tequila in the same barrels for all the resting, but at the end we mix all the barrels." Only if you don't mix the barrels, then you have actual single barrel tequila, which means that you'll only get about 280 bottles for each batch. Interestingly, Jaime Villalobos Sauza told me he was preparing a surprise, that includes the concept of Limited Edition Single barrel. Oh Boy.....I can't wait for that. PRODUCTION- single estate organic certified agaves are cooked for 10 hours in a 8 ton autoclave, or 12 hours in the 12 tons autoclave, with the temperature maintained at 100 celsius for 9 hours. A roller mill is used for crushing followed by natural yeast fermentation of the mosto, in all stainless steel tanks. Natural yeast is spontaneous fermentation, which allows environmentally available yeasts in the air to be utilized. Villalobos Sauza explained that fermentation is very different in the summer season, than in the winter, saying it was one of the factors that make small batch and single barrel processing both exciting and terrifying. The aroma represents the kind of natural yeast that was dominating the environment at that moment. Suave tequila is double distilled to 40& abv in stainless steel stills with copper coils. After the first distillation, alcohol develops to about 27% and the second and final distillation brings it to 55%. During distillation, the product naturally divides itself into 3 products- The 'cabeza' or head, which is normally too high in methanol and ethanol to be used, the 'colas' or tails, which Villalobos removes for his tequila, like he does with the 'heads', and the 'El Corazon', or the heart of the agave, which Villalobos captures and moves forward, to be Suave Tequila. For the rested and aged expressions new American Oak barrels, and used barrels including, Bourbon barrels are used. All expressions are 100% organic and also Kosher certified, and no additives are used. BLANCO- about $49.95, this is a nice clean 40% abv, double distilled blanco, with many of the base flavors as the Lunar Rested, but without the wood notes. This has a more mineral and citrus presence than the lunar rested blanco. This is how I like my blanco, more rustic, and not as smooth. This beautiful bottle with a light raw wood top, is a blanco with aromas of spice, herbs, pepper, vanilla, light smoke, anise and citrus. It has a delicious nose. The taste shows the spice and herbal notes as well, with a mild burn and some olive brine and citrus. This is a very nice well made blanco. NOSE- herbal with spice, pepper and light smoke. Cooked sweet agave, some vanilla, anise (licorice), and citrus. TASTE- thin to medium oils, spice, herbal, pepper, a mild burn, citrus and olive brine. FINISH- a medium exit of pepper, spice and smoke with a slight delightful burn on the backend. Being a 'Lou's Top Tequila' please see Suave Tequila's logo on the side of this page, click and visit Suave Tequila's website. LUNAR RESTED BLANCO- about $54.99, Suave Lunar Rested is a straw color - (SEE COLOR ABOVE), indicating almost a month in an oak barrel and has a mild bite,** which I like. This expression comes with a heavy solid metal top. Because of the resting, it has a light soft wood/oak, cinnamon, herbal and spicy aroma and taste, and is warm with a nice smokey, sweet agave, herbal, spicy and vanilla cream presence, but not too much. It hasa some light smoke which is nice, and although the resting did make it softer than a 'out of the still' blanco, it had some nice citrus (lemon), but not as much as the regular blanco, and maybe a pinch of light mint and nutmeg aroma. The taste had a light alcohol tingle with a proper bite, some fruity melon, and had an herbal and spicy mouthfeel, but with this soft and smooth feel. This would be perfect for those trying a blanco for the first time or people that like a smoother, easier blanco to sip or find blanco tequila too harsh. It's on its way to tasting like a light Repo. The barrel really softens this out. This could be considered a 'gateway tequila' for many, and this could be who it is aimed at, especially women who are jumping into the tequila game quickly, who may want a smoother and gentler blanco. This is a blanco rested in oak for 28 days, from full moon to the next full moon (lunar rested). There is a lot of theories on the gravitational pull that possibly affects how the tequila interacts with the barrel during a lunar moon. This could be true, but Jaime Villalobos told me "I didn't do it for the gravitational pull, or moon effects on the process, and I have found that people tell me that they believe there is an influence, because they believe in energy, vibes, etc, but my idea was only "romantic" on using a full lunar cycle to rest the tequila." This lunar rested blanco surprised me, as I like my blanco tequila right out of the still, and I can immediately taste the wood, but I really liked this. I was expecting this to taste too far away from an unrested blanco, and closer to a Reposado. I wasn't expecting much, but to my surprise I liked the herbal and spice, because it had a nice touch of smoke and citrus to balance it. I knew right away it was definitely a blanco, and with just enough of a bite to satisfy me. It's complicated in many ways, yet smooth to sip. You have to really try it a few times to taste the layers. My first experience with Suave Lunar rested blanco, was when I was asked to participate in a blind taste test for a Tequila Matchmaker video. I didn't even know what brands were involved, and ended up rating this very high. While rating, you factor in the price, and although it's slightly higher priced than some other blancos, the cleanliness of it, gave it high numbers. I asked Villalobos, why after 28 days, did it not have a tremendous wood presence or darker color, and as I suspected, he told me "I use a used 'tired' barrel, that previously was used for an añejo, so they are "tired" but impregnated with añejo tequila, so the color is not intense, but you can get a good extraction of flavors and aromas from the previous tequila that was in there." He said his use of American Oak barrels, charred to deliver just the right influence of smoothness, smoke and woodiness, doesn’t dominate the characteristics of the pure blanco. NOSE- herbal, spice and light pepper, cinnamon, fruity (melon), a soft light vanilla cream, oak wood, some alcohol, some smoke, agave sweetness, a clove like and/or nutmeg fragrant presence, with some citrus (lemon) and mint. TASTE- herbal, spice, light cinnamon, some fruit (melon), agave sweetness, pinch of vanilla, smoke, some citrus and a slight pleasant bite, but smooth overall, with some astringency. FINISH- herbal, vanilla cream, mint and sweetness, some alcohol, with some fruit (melon), some smoke and cinnamon, ending in a medium finish. REPOSADO- at $54.95, this is a delicious Reposado aged in charred American Oak barrels for 250 days. It has a creamy, vanilla, cherry and slight caramel aromas, with a baking spice, honey, touch of pine and a whiskey presence. On taste, it's creamy, with a whiskey and baking spice mouthfeel with vanilla and just a pinch of caramel. The Reposado comes in the twisted bottle with a red wood top. I asked Villalobos why the color looked so dark and rich in this Reposado, aged only just over 8 months, and he told me "it has that color because I used 3 different barrels- a brand new never used American oak barrels with a medium/plus toasting, a used barrel with a medium/plus toasting, and used bourbon barrel with a medium toast. This is an absolutely delicious Reposado. NOSE- agave, spice (baking spice), pepper, slight cherry aroma, cream, whiskey/bourbon/oak presence, honey, caramel and a pinch of vanilla. Some alcohol, smoke, and pine. TASTE- medium oils, some heat, sweet and creamy, with honey and a whiskey/oak mouthfeel, with some baking spice, some vanilla and caramel. FINISH- sweet, oak, caramel, and honey, ending in a somewhat short finish. The Lemon flavored Tequilcello at $29.95 is very interesting. As most Limoncello liquors are apparently made with vodka as the alcohol, this is the brainchild of Jaime and his cousin Pierluigi Pernazza. 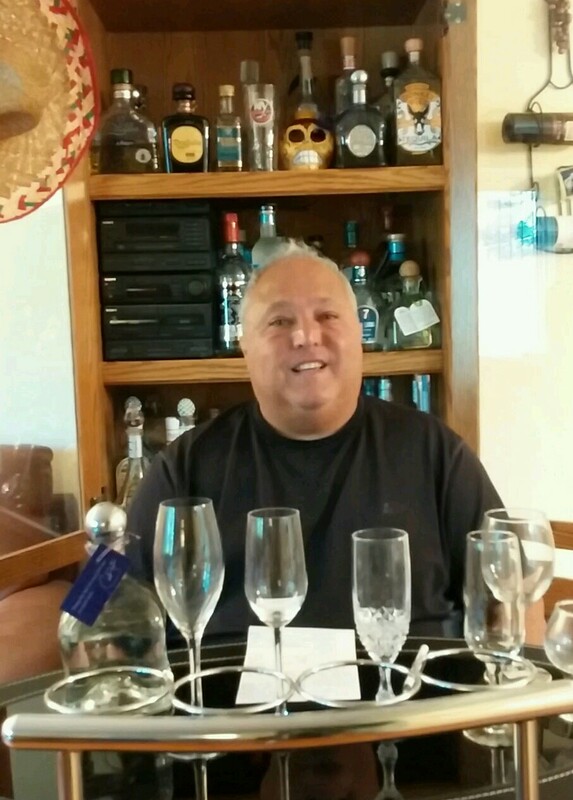 Pierluigi is 50% Italian and 50% Mexican, (See BELOW) and he is the sole distributor of Tequilcello in the US. Jaime told me that "the tequila base for tequilcello is a tequila blanco that I make in the same distillery as Suave (Hacienda de Oro 1522), but it is not Suave, it's a tequila that I make specially for Tequilcello, 100% agave Blanco, at 55% abv." He went on to say "I prepare a special batch of tequila that is 55% abv, but the final step of the preparation of the liquor, is mixing the tequila with the lemons and sugar cane syrup, which takes it down to the final product, at 26% alcohol by volume. As we discussed further, Villalobos told me "the regular base to make limoncellos are seeds based spirits, like vodka, gin, etc, and we highly improve the alcohol base by using a 100% agave tequila". I totally agree. Although sweet as it would be, this was delicious as an after dinner cordial. I have had limoncello, but preferred this without a doubt.Tequilcello is the first, and only limoncello made with tequila in the world. This authentic Italian tradition, made with 100% agave from Mexico was thought up by Jaime Villalobos over a dinner in his cousin's well known restaurant. The cousins were dining at Pierluigi Pernazza's restaurant Sagrantino’s, in Guadalajara, Mexico when Pier suggested that they enjoy a glass of his restaurant 'house' limoncello. Jaime knew immediately that 100% agave tequila would be a perfect base for limoncello. They use a rustic limoncello recipe handed down through Pierluigi’s family in Italy and the Tequilas that Jaime's family has crafted since the early 1800’s. This Tequilcello is infused with natural non-GMO Eureka lemons and sweetened with 100% pure cane sugar. They select the lemons and the purist sugar cane that can be sourced in Mexico, then hand peel the fruit, so only that top layer containing the fragrant and flavorful essential oils are used, then combining these elements with pure 100% de agave Tequila. Limoncello is made from the zest of the lemon, so it should have a strong lemon flavor without any of the sour, and also not be bitter. There are often secondary flavors in it as well, such as vanilla, and if you drink it from the freezer it will not freeze, and it will release the primary and secondary flavors one at a time, as your mouth warms it up. The true sign of an all-natural limoncello is 'Il Collarino' (the little collar), which is formed by the citrus oils that gather at the top of the bottle. This is the perfect after dinner sipper, as a dessert liqueur. Certified Kosher and non-GMO, this is 26% abv and absolutely delicious. It is best to to serve icy cold. The Suave line is a solid, clean, additive free line of tequilas. Jaime Villalobos Sauza really puts his all into making this a special brand of tequilas. I recommended giving them a try, as well as the unique and tasty Tequilcello.